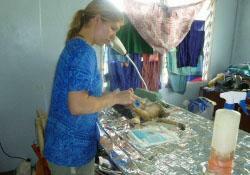 You can take part in volunteer veterinary medicine opportunities in the developing world with Projects Abroad PRO. These projects are ideal for recent graduates, qualified vets wanting a career break and retirees. We work with local partners, including veterinary clinics and animal care centres. Examples of such projects include volunteering as vet in Samoa. The treatment of and attitudes towards domestic animals across the world varies enormously, and you may find you experience some shocking cases. However, you will also be involved in improving the situation for animals like stray dogs, for example, by helping with education and awareness campaigns. As part of every project you will be working alongside local professionals and will be expected to share your own knowledge and experience. Upon application Projects Abroad PRO will take into account your current skills and training. This enables us to place each volunteer at an institution where your help and expertise will be most beneficial. Please find below a list of all the available Projects Abroad PRO Veterinary Medicine projects. As a qualified vet or veterinary nurse, you will be working alongside a qualified vet at Taricaya at a rescue centre where you will help the existing staff and volunteers.